Correcting our patients’ vision with the best lens and frame techology is our highest priority. Your doctor may recommend a single vision, no-line progressive multifocal, or standard bifocal during your exam. Our knowledgeable frame and lens specialists will then assist you with each of your eyewear decisions, and see to it that you receive your glasses in a timely manner. In many circumstances, we can produce your glasses in less than a single day in our in-office laboratories. OUR LICENSED AND CERTIFIED OPTICIANS WILL FILL YOUR OPTICAL PRESCRIPTION WITH FLAWLESS ACCURACY USING THE WORLD’S FINEST OPTICS. Unlike any spectacle retail store, we promise to ensure your satisfaction. 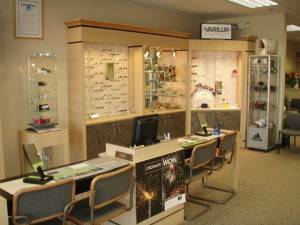 Please use this page to educate yourself regarding many of the eyeglass frames and lens options available.